There are plaques everywhere in our town. History around every corner. 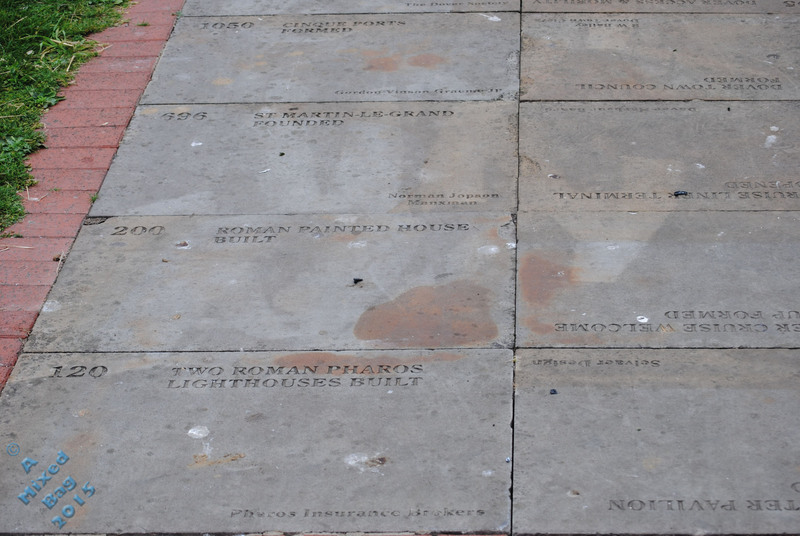 One of the biggest “Roads of History” is a set of plaques, or paving slabs, which go up to and around the bandstand. Each slab tells a piece of history of the town. I have decided to use the earliest recorded one. A slab with the date 120 AD – Two Roman Pharos Lighthouses Built, and behind it 200 AD – Roman Painted House Built. The Pharos is still there, as is the Roman Painted House. Although that is kept undercover in a museum now. This entry was posted in Photography and tagged August, Daily Photo Challenge, Dover, History, Life, Nikon, Nikon D3000, Photos. Bookmark the permalink. I love history, I wonder what the people looked like then, how they lived! I’m hoping to be able to get into the Roman Painted House soon and see if I can get some photos of it.